Madison County Public Library's new bookmobile was built on a Ford Commercial Cutaway E-450 chassis with Triton V-10 power and an automatic transmission. 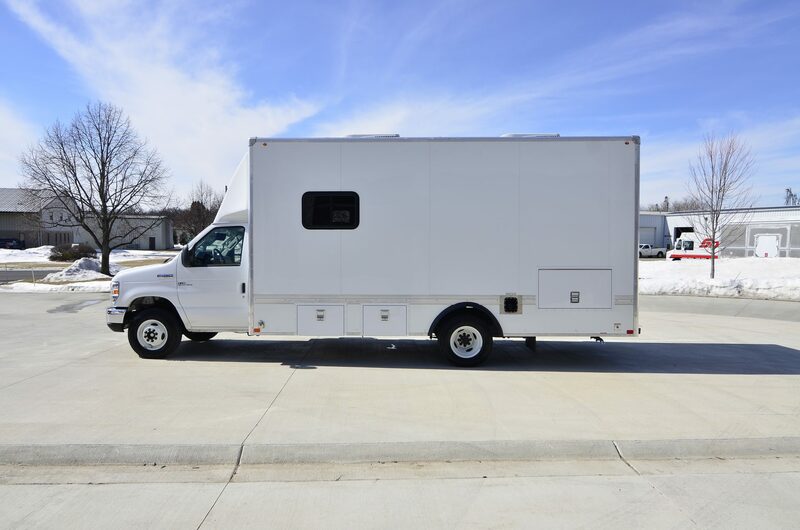 For HVAC, the vehicle features two rooftop Coleman units with a wall-mounted thermostat and a 16,400 BTU gasoline-fired furnace for heat. Electric power comes from an Onan Commercial 7kW generator housed within a custom fabricated gen box. CAT6 network cable is installed in the bookmobile as well. "The interior on the bookmobile turned out so fun. The light gray bookshelves, the retro-colored seating and the funky laminate countertops really look great. They'll get a lot of compliments on the interior for sure." - Cory Weithaus, LDV Outreach Sales Representative. INSIDE The vehicle features a curb-side entry door as well as a Braun heavy-duty electric wheelchair lift for accessibility. Once inside, Madison County selected 15° slantback bookshelves with a light gray custom powder coat. The interior also features multimedia shelves to include DVDs and Disney® VHS tapes for their patrons. For the bench seats and chairs, they went with a light blue color and to accent, a fun retro print laminate for their countertops giving the inside a light and open feel while also being fun. The bench seat bottoms are also removable for storage underneath. At the front of the interior, a custom fabricated upper cabinet with integrated microwave adds additional storage and convenience. A 40" LED Smart TV mounted to the rear interior wall was included. Two swivel chairs and a flip-down bench at the rear of the vehicle round out the interior. OUTSIDE On the outside of the bookmobile, Madison County added addition window to the body to let more natural light in, additional storage boxes in the body, an "OPEN" sign that shines brightly in the curb-side window which is controlled via the main switch panel and SSV-style scene lights.